In practical work, when selecting a consumer, it mainly considers its power-dissipation effect and safety issues in the field and what kind of live body is suitable for it, but also pay attention to economic benefits. From the perspective of corona current, the best effect of eliminating electricity (discharging electricity, power-off time) is DC high-voltage consumer, followed by power frequency high-voltage consumer, high-frequency high-voltage consumer is slightly worse. 1) It is the safety of fire and explosion protection. 2) Is there any safety damage to surrounding equipment and operators? 3) When the charge polarity of the charged body is constant or the charge is large and the moving speed of the charged body is large, the DC high voltage consumer should be selected; the installation distance should not be too large, 5cm is suitable. 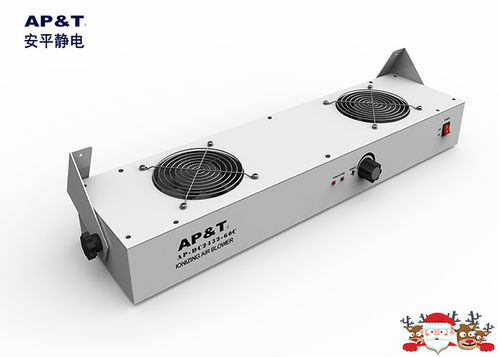 5) For charged bodies with strict requirements on residual voltage and low power consumption, such as space position, optional ion fan can be used, and high-frequency AC consumer can also be used. 7) For charged bodies with strict requirements on residual voltage and low power consumption, such as space position, optional ion fan can be used, and high-frequency AC consumer can also be used. 8) Another special static eliminator is called a space static eliminator. It was originally developed to eliminate excess static charge in space, maintain space electrostatic balance, reduce particle adhesion in space, and reduce particulate pollution. So that the particles are filtered out by the air conditioning purification system. It works in DC or pulsed DC. 5) It is easy to pollute the consumer or the environment where the temperature is above 50 °C and the relative humidity is above 70%. The installation angle of the static eliminator should be perpendicular to the surface of the charged body. In addition, the consumer should be fixed to a solid support or stationary mechanical equipment and required to be grounded reliably (eg with grounded components). In the actual process site or important equipment, the electrostatic charging body varies widely. According to the above principles, the static electricity detecting meter should be carried, and the actual installation situation of the electric appliance should be determined to determine the optimal installation distance and gas source flow rate of the electric dissipator. Electrical appliances. 1) The field power wiring should be correct, safe and reliable, and the grounding line of the electrical equipment should be well grounded (the connection resistance to the common grounding point is less than 1 ohm). 2) The on-site compressed air circuit should be clean and dry, free of dust, grease and moisture. Explosion-proof static eliminator has special conditions for its safe use. 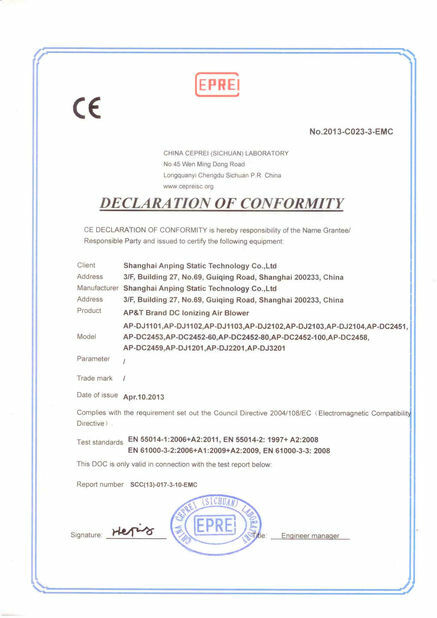 In the process of construction, installation and use, it should strictly abide by the product explosion-proof certificate, product use instructions and relevant national standards for electrical equipment for explosive atmospheres. 1) The static eliminator should be installed in an area with anti-static requirements. 2) When installing the static eliminator, the technical requirements for product use should be followed, and the electrical grounding of the equipment is good. 3) Ensure that the static eliminator discharge electrode maintains a certain safe distance from the surrounding metal parts, and can follow the requirements in the product instructions. 4) There should be no cover on the surface of the static eliminator. 5) The installation interval of the static eliminators should be based on the requirements of the site anti-static area setting requirements and product use instructions, comprehensive consideration, determine the optimal installation interval, or consult the product supplier. 6) The air inlet of the ion fan type static eliminator should maintain the necessary distance from the surrounding obstacles. For details, please refer to the product instructions or consult the product supplier. 7) There should be no obstacles between the installation position of the static eliminator and the object to be neutralized. 4. After the installation of the static eliminator is completed: the static eliminator should be in the standby or closed state, and then restarted after commissioning, trial operation and formal use. 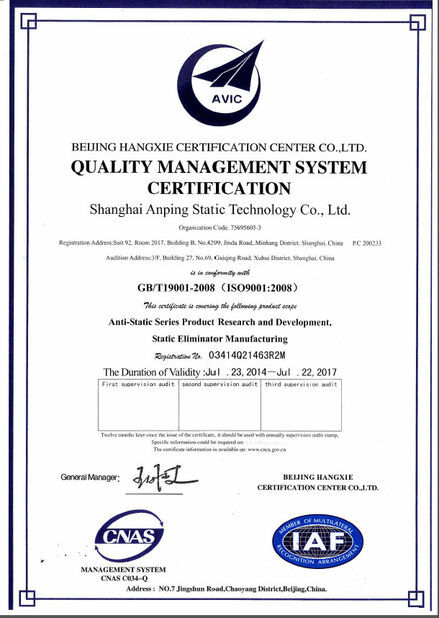 If you reprint the article, please note Shanghai Anping Electrostatic Technology Co., Ltd.